So, for your interest and delight, I present ten non-SF/F books that meant the most to me as a growing writer. Again, this list is confined to the time prior to me writing books of my own; the latest I encountered one of them was when I was in college. Likewise, as with the earlier list, this is not a list of “best” or “most important” works in a general or competitive sense — just the ones that had an impact on me, and with particular regard to the sort of writer I would eventually become. This list is in alphabetical order, by author. J.L. 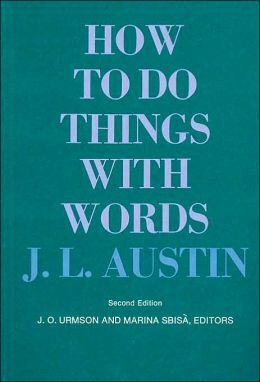 Austin: How to Do Things With Words: I have a degree in philosophy and the focus of that degree is language and all the things we do with it. Of all the books and philosophers that I read in the course of obtaining that degree, this book, and Austin, stand out. For one thing, Words is a surprisingly enjoyable read — it’s taken from a series of lectures, and Austin was apparently aware that speeches work better if you’re not falling asleep at them. For another thing, Austin put into words a thing I had always believed but (appropriately) wasn’t able to express: That language itself could do things, not just say to do things — that it wasn’t just a vehicle for intention, but could be used for action. Whether Austin intended it this way or not, this said to me that language has its own native powers, and got me to think about what I and everyone else was doing, intentionally or not, when we used the words we used. That’s been useful for both my fiction and non-fiction. Truman Capote: In Cold Blood: I read this in middle school, for my own curiosity rather than a book assignment (I don’t imagine the book, then or now, would be assigned in most middle schools). I can’t remember specifically why I picked up the book, but I remember being sucked into it by the way Capote told the story, setting the scene and chronicling the events in a way that read halfway between journalism and fiction. I’d learn later that people called it (both positively and negatively) a “non-fiction novel,” which I think very accurately represents the feel of the book. There is some question as to whether all the details of the book are accurate to true life (it seems not), but for me it was captivating to read it and know that this — or something very like it — happened in the real world. Louise Fitzhugh: Harriet the Spy: I read this, I think, in fifth grade, and there was a massive disconnect between the late 70s poverty-ridden suburban California boy I was and the mid-60s privileged New York girl that Harriet was, and yet I felt a very real connection to her. We were both smart, observant, stubborn and more than occasionally jerks, as much out of the principle of the thing as anything else. Fitzhugh did two important things in Harriet: One, she didn’t make Harriet any more likable than she should have been, and that was a revelation in itself. Two, she told an unvarnished truth about human relationships (through the character of Ole Golly) and trusted Harriet — and by extension the reader — to understand the subtleties at play there. 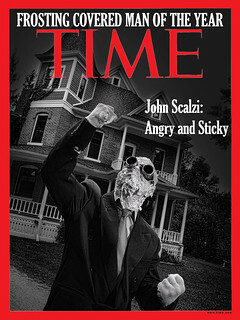 It was a book for kids that took the kids seriously, as characters and readers both. Stephen King: Christine: Christine was not the first Stephen King book I read (that would be The Stand, which I read at ten years old, which is, uh, an interesting age to read that particular book), but it was the first Stephen King book I read where I got what it was that King was doing — making a normal world with normal people in it and have everything progressively go further and further into hell. King doesn’t write like someone who condescends to the Great American Middle, or tries to explain the people in it to readers on the outside, staring in like they were at the zoo (which is among other things why he was underappreciated for as long as he was by literary critics). He just shoves those people into the crucible and waits for the heat and pressure to kill them or make them heroes, and writes interestingly about what happens to them either way. This is hugely important stuff. Christine isn’t King’s best, but it’s the one that I first took an important writing lesson from, and for the purposes of this list, that’s good enough. 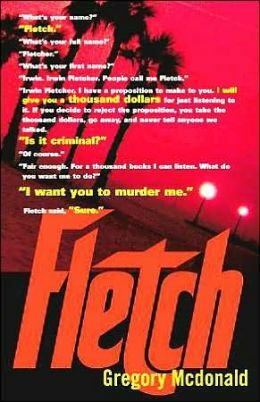 Gregory Mcdonald: Fletch: Fletch and Mcdonald are important to me for one word: Dialogue. As in, Mcdonald was a master of it, and it was absolutely essential to Fletch (and its many sequels). How important? 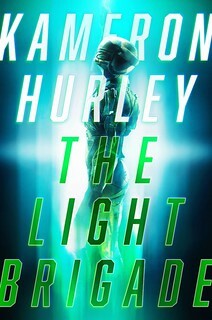 Important enough that the book’s dialogue was — and as you can see from the cover shown here, still is — a featured graphic element on the book covers of the entire series. That’s a genuinely remarkable thing. And it’s correct; the dialogue is incredibly important in establishing characters, setting scene and telling large chunks of the story. Mcdonald was not big on description; it was hardly there and when it was, it was the bare minimum required for the story. It’s not a stretch to suggest that of all genre writers, the one that my writing style is closest to is Mcdonald. It’s also worth noting that when I first set down to see if I could write a novel, I more or less flipped a coin to see if I would write one in science fiction or one in the crime genre. In another, slightly different universe, it’s entirely possible that the reviews for first novel I had published have me hailed as “the next Mcdonald” rather than “the next Heinlein.” I would have been okay with that. H.L. Mencken: A Mencken Chrestomathy: In my freshman year of high school I was reading from a book of quotations and noticed that many of the best quotes — the ones that were really punchy — were from some dude named Mencken. I went to my school library, which had the Chrestomathy, checked it out and started reading. By the time I was done with the book two things had happened. One, I had fallen in love with the 1920s (a fact which will be important later in the list). Two, I wanted to be a newspaper columnist really really badly. It’s not at all incorrect to suggest that for the first portion of my writing life, the part where I wrote columns and reviews for a living, Mencken was arguably the most significant influence. Nor is it incorrect to suggest that he continues to be important, since you may note that I’ve been writing columns here for more than fifteen years, and have no intention of stopping. 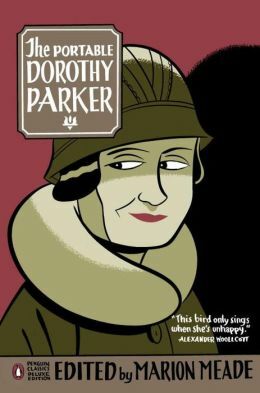 Dorothy Parker: The Portable Dorothy Parker: As noted above, HL Mencken was my entrance into the world of 1920s literati, and it wasn’t long until I made the acquaintance of the members of the Algonquin Round Table. They were funny and witty and, from across the gulf of six decades, the possessors of the sort of deeply romanticized writing life I wanted to have one day when I grew up. Pre-eminent among them for her wit, her quippiness and general smarts, was Parker. The Portable has many of the good bits I first enjoyed from her, as well as the bits that I enjoyed the older I got and the more I learned about Parker and her compatriots, and realized that the quippy glamour of their lives was not all there was to it, and the rest of their lives were as muddled and occasionally unhappy as anyone else’s (she did end up attempting suicide, after all). For all that, if one has to have an early idol of humor and wit, one could have done far worse than Ms. Parker. Carl Sagan: Cosmos: The companion book to the TV series was given to me as a birthday gift, I think for my eleventh or twelfth birthday. The big, beautiful, full-color hardcover, I would note, which to me seemed like the most amazing thing humanity had created to that point. I spent about a month just looking at pictures and captions before diving in and reading the actual text — which of course was another treat in itself. Sagan’s obvious love of science and the universe, and his desire to share that love in a way that was accessible to all but the most truculent of others, is something that I took to heart when I was writing my own non-fiction and even in my science fiction: That most things can be explained to most people, in a way that didn’t talk down or condescend but instead lets people in on the secret and makes them want to know more. That’s a gift I can’t thank the man enough for. George Bernard Shaw: Saint Joan: In high school I had a class called Individual Humanities, the idea being that the whole point of civilization was the development of “independently acting and thinking individuals who saw as their highest life crisis service to their community.” Which is a hell of an idea if you think about it. One of the readings for the class was Saint Joan, and along with the play itself, we read the prefatory material (which with many of Shaw’s works was often longer than the play itself) in which Shaw discussed the “evolutionary appetite”: the idea that some people, against all personal benefit or gain, are compelled to act in a way that pulls humanity forward (often with kicking and screaming on humanity’s part). It’s a heady idea, and whether it has a rational basis in fact, it’s something that’s embedded in my head when I write characters who are facing crises of their own. 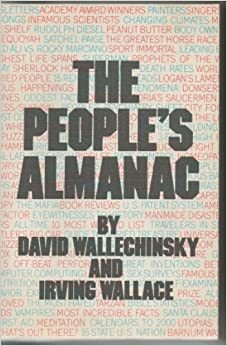 David Wallechinsky and Irving Wallace: The People’s Almanac: I ate this book and its two sequels when I was a kid. It was random and yet so densely packed with digestible information that it seemed likely that everything it was possible to know was in the book. For a six year old with a voracious reading appetite, which I certainly was, it was godsend. My mom thought the same thing, since she could give it to me and I would squirrel up in a corner with it for hours at a time. From these books I learned that everything could be interesting, and since everything could be interesting, that it was interesting to learn about everything. This is an idea and ethos that have served me well as a writer: Since I know a little about a lot of things, it’s convinced people to pay me to write on those subjects (which has given me a reason to learn more about them and get paid while doing it). It also makes me excited to tell other people about what I’ve learned. If you want to know where it all began for me, in terms of writing, this really is the place to start. Not noted here: A number of works for stage and screen, and other non-literary media which still require writing, and the brains that create that writing. I’ll talk about those, possibly, some other time.